Get a sense of the local culture at Interpretation Center and Catedral Inmaculada Concepcion. Visit Cerro Brujo and La Loberia for some beach relaxation. Spend the 2nd (Wed) exploring nature at Cerro Tijeretas. And it doesn't end there: enjoy the sand and surf at Punta Pitt, make a trip to Segunda Zona Naval de la Armada del Ecuador, go for a walk through Malecon San Cristobal, and tour the pleasant surroundings at Playa de Oro. To find photos, ratings, more things to do, and tourist information, you can read our Puerto Baquerizo Moreno holiday maker app . Reykjavik, Iceland to Puerto Baquerizo Moreno is an approximately 25-hour flight. Traveling from Reykjavik to Puerto Baquerizo Moreno, you'll gain 5 hours due to the time zone difference. Prepare for much warmer weather when traveling from Reykjavik in October: high temperatures in Puerto Baquerizo Moreno hover around 30°C and lows are around 24°C. Wrap up your sightseeing on the 7th (Mon) to allow time to ride a ferry to Puerto Ayora. Escape the urban bustle at Charles Darwin Research Station and Galapagos Beach at Tortuga Bay. Get some cultural insight at Galeria Aymara and Maprae. 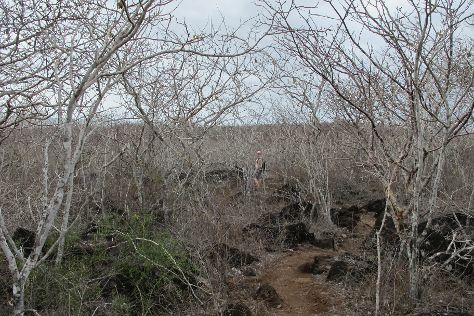 Step out of Puerto Ayora with an excursion to North Seymour Island in Baltra--about 1h 20 min away. There's much more to do: identify plant and animal life at Reserva El Chato, see some colorful creatures with a scuba or snorkeling tour, explore the world behind art at Galeria Exotico Ecuador, and tour the pleasant surroundings at Playa de los Alemanes. To see where to stay, more things to do, reviews, and more tourist information, read Puerto Ayora trip planner. Traveling by ferry from Puerto Baquerizo Moreno to Puerto Ayora takes 2.5 hours. Expect a daytime high around 30°C in October, and nighttime lows around 24°C. Finish your sightseeing early on the 13th (Sun) so you can travel to Cusco. Popular historic sites such as Sacsayhuaman and Centro Historico De Cusco are in your itinerary. Appreciate the collections at Pre-Columbian Art Museum and Museo Maximo Laura. Next up on the itinerary: steep yourself in history at Plaza de Armas, explore the ancient world of Sacred Valley of the Incas, wander the streets of San Blas, and contemplate in the serene atmosphere at Qorikancha. To find maps, photos, and more tourist information, use the Cusco route builder tool . Traveling by combination of bus, ferry, shuttle, and flight from Puerto Ayora to Cusco takes 16 hours. Traveling from Puerto Ayora in October, expect nights in Cusco to be much colder, around 7°C, while days are little chillier, around 24°C. Cap off your sightseeing on the 19th (Sat) early enough to travel to Santiago. Satisfy your inner culture vulture at La Chascona and Concha y Toro. Visiting San Cristóbal Hill and Ski Portillo will get you outdoors. You'll find plenty of places to visit near Santiago: Parque Nacional Pali Aike (in San Gregorio), Vina El Principal (in Pirque) and River Rafting & Tubing (in San Jose de Maipo). The adventure continues: explore the world behind art at Museo Chileno de Arte Precolombino, see the interesting displays at Centro Cultural Palacio de la Moneda y Plaza de la Ciudadania, fly down the slopes at Valle Nevado - Ski Resort Chile, and do a tasting at Santa Carolina. For more things to do, where to stay, and more tourist information, use the Santiago day trip planning tool . Traveling by flight from Cusco to Santiago takes 9 hours. Alternatively, you can drive; or take a bus. You'll lose 1 hour traveling from Cusco to Santiago due to the time zone difference. Wrap up your sightseeing on the 25th (Fri) to allow time to travel to Buenos Aires. Appreciate the collections at Museo Nacional de Bellas Artes and Museum of Latin American Art of Buenos Aires. San Telmo and La Boca will appeal to history buffs. Take a break from Buenos Aires with a short trip to Museo de arte Tigre in Tigre, about 48 minutes away. The adventure continues: take a stroll through Puerto Madero, contemplate the long history of Museo Nacional De Arte Decorativo, take in nature's colorful creations at Parque 3 de Febrero, and make a trip to Plaza de Mayo. To find reviews, other places to visit, photos, and tourist information, you can read our Buenos Aires trip planner . Fly from Santiago to Buenos Aires in 5.5 hours. Alternatively, you can drive; or take a bus. The time zone difference when traveling from Santiago to Buenos Aires is 1 hour. In October, plan for daily highs up to 24°C, and evening lows to 17°C. Wrap up your sightseeing on the 31st (Thu) early enough to travel to Iguazu National Park. Start off your visit on the 1st (Fri): take in the dramatic scenery at Cataratas del Iguazu. Here are some ideas for day two: step off the mainland to explore Isla San Martin, admire the sheer force of Salto Bernabe Mendez, and then take in the dramatic scenery at Salto San Martin. To see reviews, photos, other places to visit, and more tourist information, you can read our Iguazu National Park visit planner. You can do a combination of flight and taxi from Buenos Aires to Iguazu National Park in 3.5 hours. Other options are to drive; or take a bus. Traveling from Buenos Aires in October, expect nights in Iguazu National Park to be about the same, around 19°C, while days are a bit warmer, around 34°C. Wrap up your sightseeing on the 2nd (Sat) to allow time to travel to Rio de Janeiro. Visiting Praia de Ipanema and Praia de Grumari will get you outdoors. Your itinerary includes some good beach time at Copacabana Beach and Flamengo Beach. The adventure continues: kick back and relax at Pedra do Arpoador, admire the natural beauty at Jardim Botânico do Rio de Janeiro, get advice or help at Centro Cultural Banco do Brasil - CCBB Rio de Janeiro, and stroll through Barra da Tijuca Beach. To see where to stay, maps, reviews, and other tourist information, you can read our Rio de Janeiro itinerary builder website . Traveling by combination of car and flight from Iguazu National Park to Rio de Janeiro takes 4 hours. Alternatively, you can drive; or do a combination of bus and car. Traveling from Iguazu National Park in November, you can expect nighttime temperatures to be somewhat warmer in Rio de Janeiro, with lows of 25°C. Wrap up your sightseeing on the 9th (Sat) to allow time to travel to Ilha Grande. Get outdoors at Lagoa Azul and Morcego Beach. You'll enjoy a bit of beach vacationing at Grumixama Beach and Sitio Forte Beach. There's still lots to do: kick back and relax at Dois Rios Beach, tour the pleasant surroundings at Camiranga Beach, and head off the coast to Praia de Dois Rios. To see reviews, other places to visit, maps, and other tourist information, read Ilha Grande visit planner. You can do a combination of bus and ferry from Rio de Janeiro to Ilha Grande in 4 hours. In November, plan for daily highs up to 34°C, and evening lows to 24°C. Finish up your sightseeing early on the 16th (Sat) so you can travel to Fernando de Noronha. 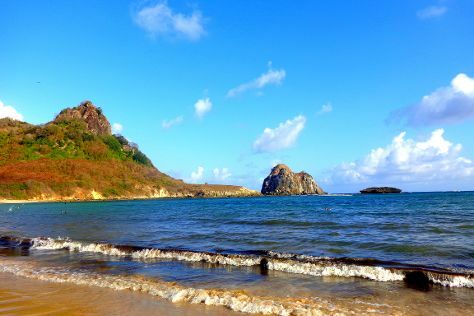 Visit Ponta das Caracas and Fernando de Noronha for some beach relaxation. Visiting Porto de Santo Antonio Beach and Conceicao Beach will get you outdoors. The adventure continues: enjoy the sand and surf at Praia do Cacimba do Padre, stroll through Baia do Sancho, and get outside with Baia dos Porcos. To find reviews, more things to do, traveler tips, and more tourist information, read our Fernando de Noronha trip maker website . Traveling by combination of ferry, bus, and flight from Ilha Grande to Fernando de Noronha takes 11.5 hours. You'll lose 1 hour traveling from Ilha Grande to Fernando de Noronha due to the time zone difference. Traveling from Ilha Grande in November, expect a bit warmer with lows of 29°C in Fernando de Noronha. Wrap up your sightseeing on the 23rd (Sat) to allow time to travel to Porto de Galinhas. Outeiro church and panoramic view and Museu das Tartarugas - Ecoassociados are good opportunities to explore the local culture. You'll get in some beach time at Carneiros Beach and Pontal de Maracaipe. 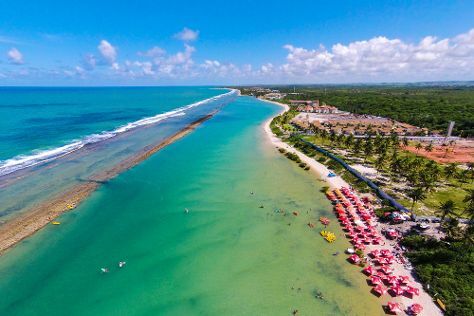 There's lots more to do: stroll through Muro Alto Beach, sample the fine beverages at Cachacaria e Pimentaria Tio Gilson, enjoy the sand and surf at Vila de Porto de Galinhas Beach, and explore the gorgeous colors at Natural Pools of Porto de Galinhas. To find other places to visit, more things to do, photos, and other tourist information, read our Porto de Galinhas travel tool . Traveling by combination of flight and shuttle from Fernando de Noronha to Porto de Galinhas takes 3.5 hours. You'll gain 1 hour traveling from Fernando de Noronha to Porto de Galinhas due to the time zone difference. In November, daytime highs in Porto de Galinhas are 34°C, while nighttime lows are 28°C. Finish your sightseeing early on the 28th (Thu) to allow enough time to travel back home.